Do you know that the most important thing after successfully writing your 2019/2020 jamb exams is to check your score? 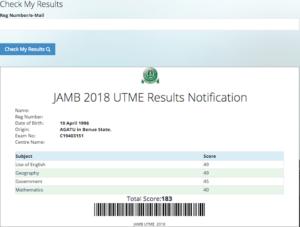 This article is a detailed guild on on how to check JAMB result without PIN and serial number. We realize that 2019/2020 jamb candidates have been searching for how to check their results with just jamb registration number, no one want to go through the rigorous process involved while using pin and serial number. Everyone wants short cut in which they won’t spend unnecessary time, hour and resources when there are well known short cut to still actualize their aim and objectives. Before we show you how to check your jamb result without pin and serial number there are certain things we will like you to note about jamb result checker. 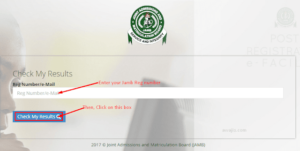 3 How to print original JAMB result 2019/2020. 10 What Is Next after Checking Your JAMB 2019/2020 Results? 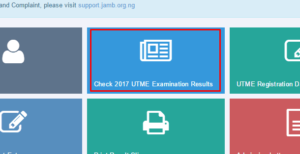 If you are ask What is JAMB result checker?in your post UTME screening exams, Hope you can give a simple explanation? Jamb result checker is a platform that helps you to check your jamb results slip. It’s just the process of checking your jamb score after a successful jamb exams. If you want to check your jamb results right now you can follow our tips and tutorials here now!!!!! Remember that you can check your jamb results using phones, iPad and computer systems. If you don’t have a jamb profile, create one now, if you have login. A space will be provide for you to input your jamb registration number. Input your jamb registration number in the right format. 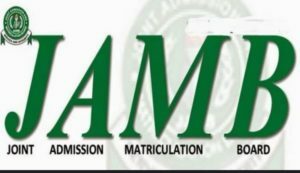 How to print original JAMB result 2019/2020. Before you can be able or granted access to print your JAMB original result, you must maintain a profile with JAMB. Lets assume you now have your profile, click here and login to your profile. To sign in one needs a valid email address and password. Take note of an important transaction ID that is generated. A continue button comes up for you to click on so as to go over the next stage. Make payment for your JAMB original result using an online payment method or bank. After you finalize your payment, you will be asked to enter your your JAMB registration number and exam year. After this you will now be able to print your result. Do not pay anyone money just to check your results, you can do it your self. If you couldn’t find your result on jamb portal, give it a trial in few days time. If the system is busy, you can equally check it at night when most people are asleep. Now that you have successfully checked your results, it’s time to start preparing for post utme screening exams. The first thing to do is to visit jamb result checker. Or you follow the instruction listed above. You can now input your PIN, Serial No or Reg Number. Don’t forget to print out your results for future references. With the introduction of JAMB profile we all can now do various things through the jamb profile account. Remember that you must have and maintain a personal profile account with jamb before now. The main question on the mind of thousands of candidates now is how do i check my name on the just released JAMB results through my jamb profile? Don’t panic about the process that is what this page is all about, we are going to give you a well detailed guide that will see you through checking your jamb results right now. Put on your data to connect your system be it phones, tablets, iPhone, iPhone or laptops to the internet. Open your favorite browser, if you should ask me I would have preferred Chrome or Firefox or any responsive browser. By now a space will appear for you to type in your username and password. Input this details correctly. Note: password are always sensitive. At this point you only need to enter your jamb registration number correctly and in the right format as it appeared on your slip. You can equally enter your email address. Then you need to perform the last action by clicking on ‘Check My Results’. Give the system time to search your result, if much people are online checking their results it will be slow,if your connection is slow same thing applies. But once your result has been fetch by the system it will display it to you. No need to get a scratch card: cards system has been eliminated by jamb boss. JAMB result is final: upgrading of scores and editing of results are all scam don’t fall for it. Jamb remains transparent in all they do, they won’t ask you for money to rank you higher. Immediately you are done checking your result the next thing to do is to check your school of choice here, try to find out the latest information. Your 2019 jamb result can be checked on any device you have that can connect to the net..
Never you seek help online in exchange for money. There is nothing you can do to change the score. Upgrading of score is a scam. Remain calm and accept what you have seen. Explore other options like polytechnics, universities that accept lower score or college of education. Check when jamb change of course form will be out. Finally don’t Transact with faceless people online. “You Do Not Have Any Result Yet;” is one of the sad news any candidates should see but it does happen. if you have checked your result and you get this response just relax and check by after few days or the next 24 hour. Sign into your JAMB profile. What Is Next after Checking Your JAMB 2019/2020 Results? Now that you have been able to see your JAMB score the main question is what next? No matter how low you score as far as its not below 100 there is still chances that you might still be consider for admission in either polytechnics or universities. First your JAMB score should determine your next move. Did you score at least 180 and above? You still stand a chance to take post UTME written exam in the university of your choice as over 99.9% accept 180. If you got 100 above you still have a good chance and sure standing in securing admission into 99.9 polytechnics in Nigeria be it federal or state owned. Another step to take is to quickly get a change of institution form if you wish to change to any school that will accept your score. I have written an article here on JAMB change of course form here. After your change of course form, try to know the departmental cut off mark for the course you change to and work towards that as your prepare for the forthcoming post UTME screening exercise. Never stop reading for your post UTME screening exercise that is coming. Please don’t relax instead double your reading. Get past questions if possible and study with it.